These are our two most popular classes. The combination of the two will give you the just what you need to stencil your abode beautifully. Prices can very depending on location and special offers, but this will give you a general idea. The Essential class will greatly improve the outcome of any of the project classes. 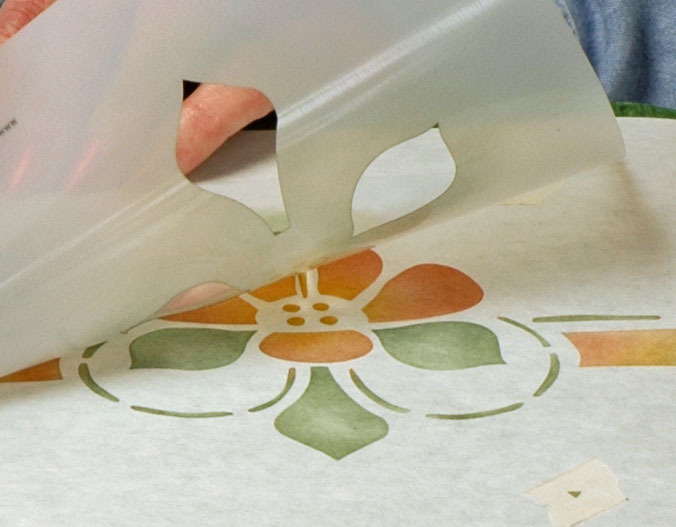 A great way to become familiar with stenciling, this fun class will allow you to vanquish your stenciling inhibitions! Covering the fundamentals and with plenty of helpful hints and personal attention, this hands-on workshop will teach you the various techniques used on walls, curtains & table linens often found in Arts & Crafts period homes. You’ll be amazed at what you can create! Approximately 2 to 2-1/2 hours. Price includes all materials to work with and will vary depending on location. 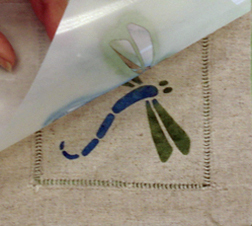 This popular workshop gives you the opportunity to learn about stenciling fabrics while working on various materials. Taking the Essential class prior or previous stenciling knowledge (preferably with the Paintstik® medium) will greatly improve your results. Cost includes all materials to work with and you get to keep all your fabric samples. Approximately 2 to 2-1/2 hours. Price will vary depending on location.